Heat oven to 325°F. Spray bottom only of 9-inch springform pan with cooking spray. Make brownie mix as directed on box, using water, oil and eggs. Spread in pan. In large bowl, beat milk and pudding mix with wire whisk about 2 minutes or until thickened. Fold in whipped topping and chocolate chips. Pour over brownie. Cover and freeze at least 4 hours before serving. Remove side of pan. Serve with raspberries. Store covered in freezer. For a spectacular presentation, drizzle chocolate topping on dessert plates before adding the torte. 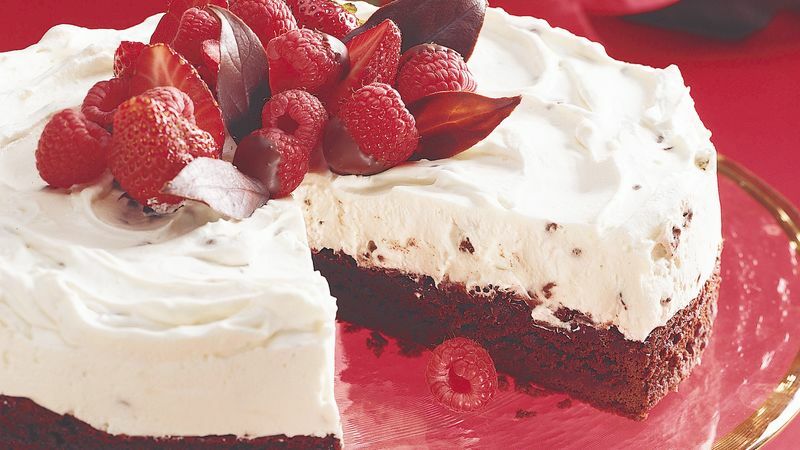 Or drizzle chocolate topping over the top of the torte, and garnish with chocolate-dipped strawberries or raspberries.